It’s the last Saturday of the month (June), and as has been the practice for years, it is environmental sanitation day in Lagos. 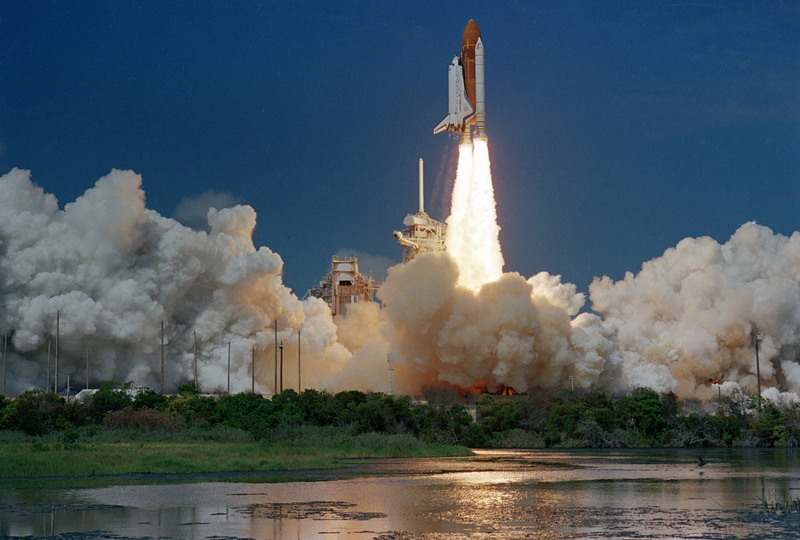 Human and vehicular movement is restricted until 10 am as Lagosians are expected to devote three hours (starting 7 am) of the morning to clean up their surroundings. 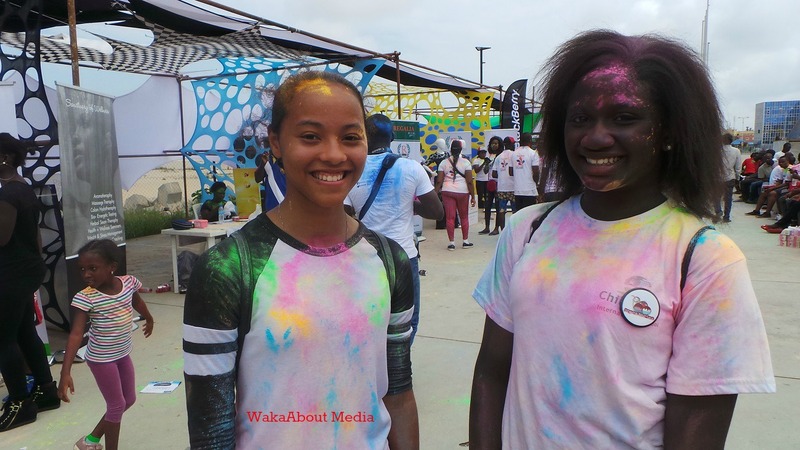 The day is warm, bright and beautiful, the perfect atmosphere for a morning out at the beach, which is what some residents on the Lagos Island did on Saturday 27 June, turning up for the first edition of the Lagos Colour Splash, designed to be a blend of running, jogging, walking, bicycling and strolling. Everybody assembles at the Bar Beach Waterfront as early as 6 am, and branded T-shirts are handed out to interested persons on request. 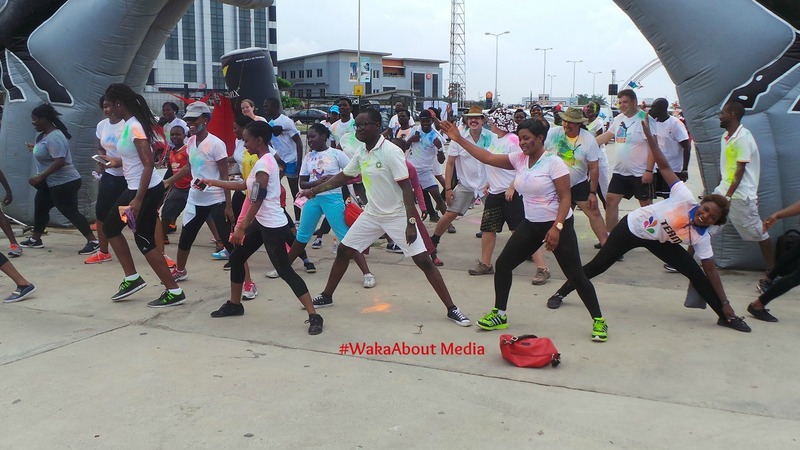 After some exercising and aerobics with music in the background, the party sets out on the pre-determined 5.3 km route, connecting Akin Adesola Street, Adeola Odeku Street and Ahmadu Bello Way. After many “waves” of runners and joggers departed the Bar Beach Waterfront, everyone is back at again the starting point—to rest, to refresh, to chat and to dance. It’s an uplifting gathering of the young and the old, all of them having fun. 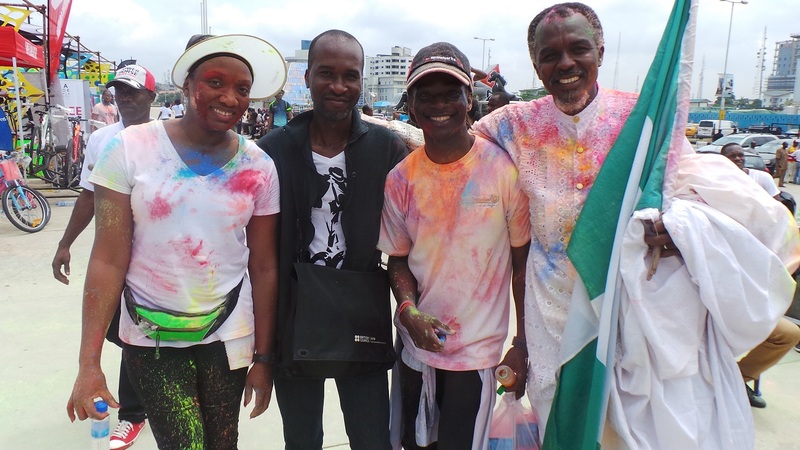 “One of the things we know how to do in Lagos is to let our hairs down by partying,” goes the intro of a piece on the event, published in the March 2015 edition of In The City Lagos, a free monthly magazine and one of the organisers. The feature goes on to describe the event as a “lifestyle event like no other, [and] an opportunity to mingle and network”. Besides the fun, keeping fit is the other part of the bargain for the hundreds of participants. 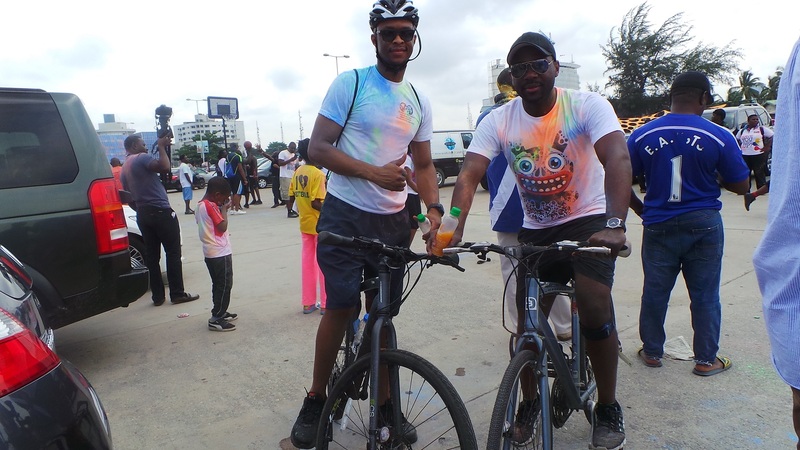 In the City Lagos writes: “The Lagos Colour Splash will help you get off your couch and away from those plantain chips and groundnut, work towards your lofty personal fitness goals, give you something super cool to do with your friends and family”. 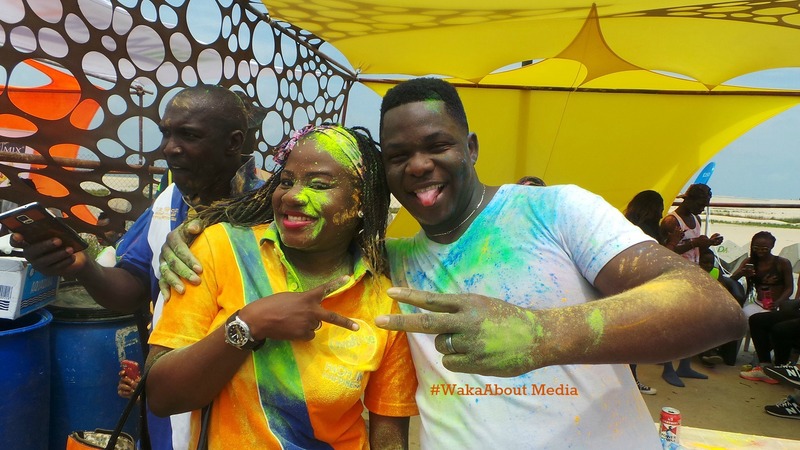 A couple having colourful fun…. 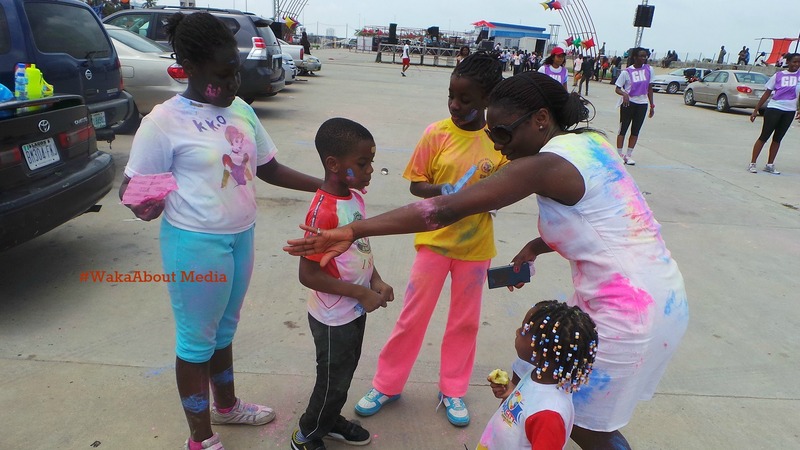 Whether it happens once or twice in a year, the Lagos Colour Splash is the coolest of the cool tourist-friendly beachside shows I have seen hosted in Lagos. It is one that deserves to be on the state’s official calendar of tourism-based activities for tourists to the city.